Skrímsli í myrkrinu! | Monster in the Dark! Endurskinsmerkið er hannað í samvinnu við Safnbúðir Reykjavíkur og Funshine og á rætur að rekja í bókaröðina um litla skrímslið og stóra skrímslið. Fæst í safnbúðunum í lista- og menningarsöfnum Reykjavíkurborgar. ♦ Design: Angry Little Monster says “No!” to murky shadows and is ready to fight the darkness with its sparky attitude. Little Monster would really like to hang out with anyone who dares seek adventures and go for a walk in the dark. It also likes to just hang around and practically shines if it’s allowed to decorate the Christmas tree. This Monster-reflector was designed in collaboration with Reykjavík Museum Shops and Funshine, inspired by the Monster series. 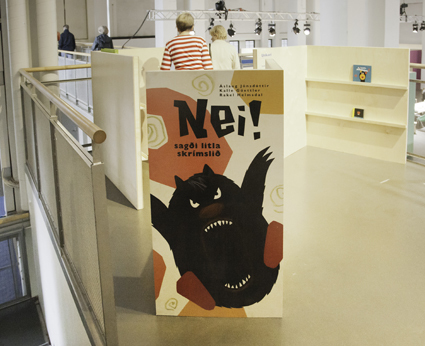 Available in Reykjavík library-shops, art and culture museums. ♦ Bókahönnun. Litla skrímslið tók sig ljómandi vel út á hönnunarsýningunni „Everyday Discoveries“ í Helsinki. 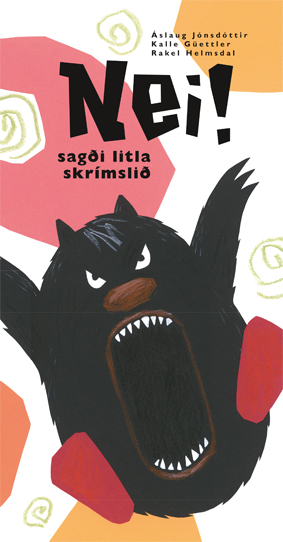 Ég skrifaði um sýninguna í sumar en fékk þessar myndir frá Hönnunarmiðstöð fyrir skemmstu. Það má lesa meira um sýninguna hér og hér og um finnska hönnunarveldið og World Design Capital Helsinki hér. ♦ Book design. 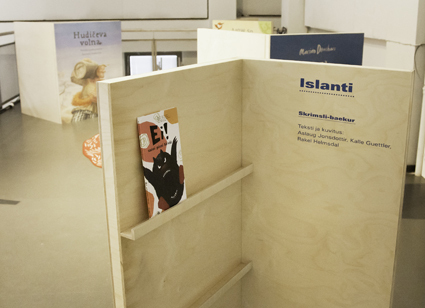 These are photos from the exhibition “Everyday Discoveries” in September in Helsinki. World Design Capital Helsinki is still on and worth visiting as always. I wrote about the exhibition earlier. More on Everyday Discoveries here og here and World Design Capital Helsinki here. Ljósmyndir | Photos: © Noora Isoeskeli – Hönnunarmiðstöð – Iceland Design Centre. ♦ Bókahönnun. Litla skrímslið fer hamförum í Helsinki í september. Þá opnar sýningin „Everyday Discoveries“ og kápumynd fyrstu skrímslabókarinnar, Nei! sagði litla skrímslið, verður til sýnis í yfirstærð, ásamt margskonar hvunndagshönnun frá 23 löndum. Það má lesa um sýninguna hér. Sýningin er í Suvilahti, Helsinki, 6. -16. september 2012. “Everyday Discoveries” is unique in its comprehensive presentation of international design. The exhibition will see more than 20 countries showcase their design, ideas and concepts as well as organise a number of different events. The exhibition’s underlying theme is day-to-day life – what is it like in the participating countries, and what kind of solutions to certain everyday situations have people come up with in the different countries? “Everyday Discoveries” is produced by Design Forum Finland. Everyday Discoveries is a World Design Capital Signature Event.